Adelaide, Australia – Royal Philips Electronics (NYSE: PHG, AEX: PHIA) today announced Australia’s first installation of its AlluraClarity intervention suite with new ClarityIQ technology at the Royal Adelaide Hospital in Adelaide. 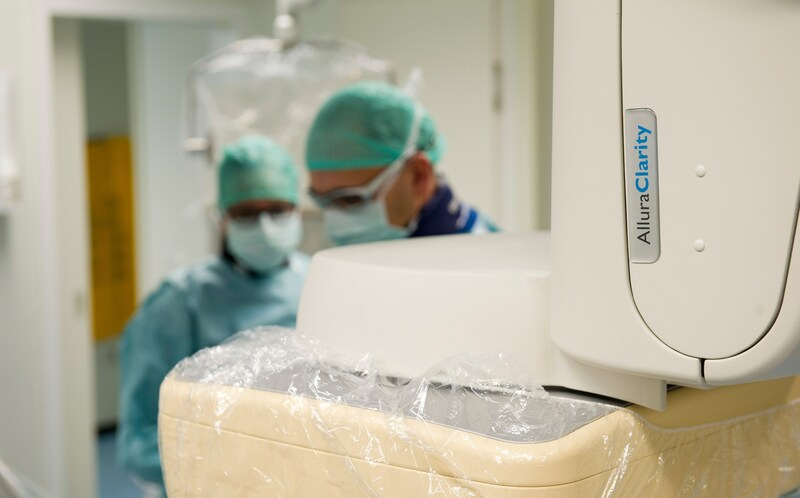 Philips AlluraClarity is a powerful interventional imaging¹ system that enables clinicians to dramatically reduce the x-ray radiation dose required during interventional neuro-radiology procedures by up to 73 percent², without compromising on image quality. The installation was also the first in Asia Pacific. Traditionally, lower radiation dose during interventional x-ray procedures, such as for the diagnosis and treatment of aneurysms and tumors, has meant corresponding lower image quality – which could impact on a radiologist’s ability to accurately diagnose and treat patients. Campus Clinical Head of Radiology at Royal Adelaide Hospital, Dr Mary Moss, believes the AlluraClarity installation will provide improvements in patient care. Radiologists at the hospital can now monitor dose radiation levels in real-time with Philips’ DoseAware system. The DoseAware system provides instant, time-stamped feedback in the examination room so that staff can immediately see the level of radiation exposure to radiologists, nurses and radiographers in the room and gives clinicians the ability to modify their work practices. Previously, patients undergoing interventional procedures at Royal Adelaide Hospital had to be transferred to another room post-procedure when requiring a CT (Computed Tomography) scan. Integrated CT functionality on the Philips AlluraClarity will help in saving time and also freeing up CT imaging rooms at the hospital. Commenting on the installation, Alan McCarthy, Country Manager for Philips Australia and New Zealand said the Philips AlluraClarity interventional suite at Royal Adelaide Hospital is the most advanced angiography suite of its kind in the country. For more information on the Philips AlluraClarity with ClarityIQ technology, please visit www.philips.com.au/healthcare. ¹ Interventional imaging: A medical specialty in which minimally invasive procedures are performed to diagnose and treat diseases such as aneurysms and tumors using image guidance. ² Landmark study at Karolinska University Hospital, Stockholm, Sweden 2011 – In the Karolinska Hospital clinical trial, independent interventional neuro-radiologists compared images from two neurological digital subtraction angiography runs on the same patient, the first using Philips current Allura Xper system and the second using the new Philips AlluraClarity with ClarityIQ technology. The results of the study demonstrated that the AlluraClarity provided equivalent image quality at up to 73 percent less dose.